Laughlin USA - Fast Reliable Business Incorporation & LLC formation - What is a Employer Identification Number (EIN)? What is a Employer Identification Number (EIN)? The Federal Employee Identification Number also known as an (EIN) is required for all businesses utilizing a Corporation, LLC, Non-Profit or Sole Proprietorship. This number will be used to file all appropriate taxes with the IRS and is often required when working with vendors. 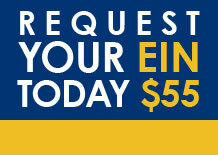 To request an EIN number you will need to provide your social security number and a physical address.